That long line of cones splicing Sunset Boulevard on Thursday night, steering traffic away from the famed Chateau Marmont, came with good reason. 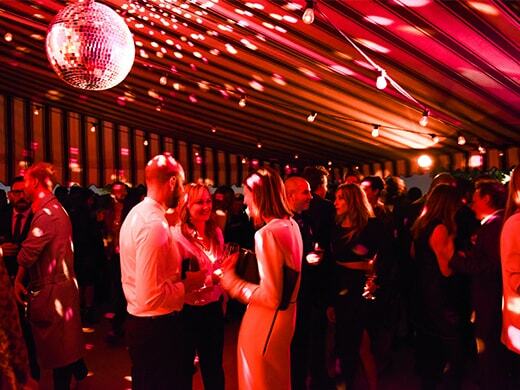 Throngs of Golden Globe nominees and other captains of pop culture ascended to the rooftop penthouse for a pre-Golden Globes weekend soiree tied to the release of W Magazine’s Best Performances portfolio. 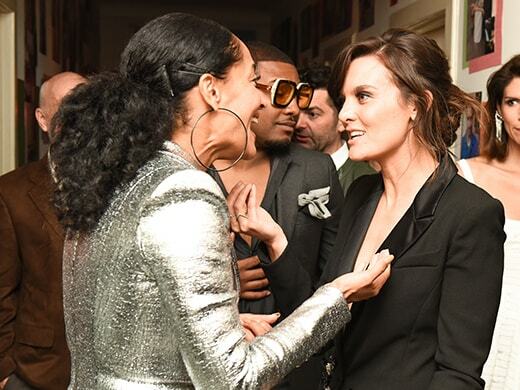 Much like how their corporate cousin Vanity Fair swallows Oscar week’s glitterati, W Magazine Editor In Chief Stefano Tonchi, Best Performances guru Lynn Hirshberg, and their glossy squad drew the power players around Golden Globes weekend into a single orbit on Thursday night. The stars in the middle of that orbit? 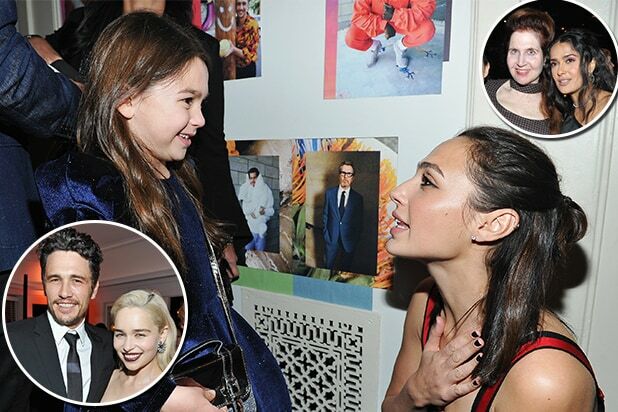 Salma Hayek, “Wonder Woman” Gal Gadot, James Franco, Mary J. Blige and a rare sighting of Olsen sisters Ashley and Elizabeth (not Ashley’s twin) in the same room. Less accessible was Gal Gadot. 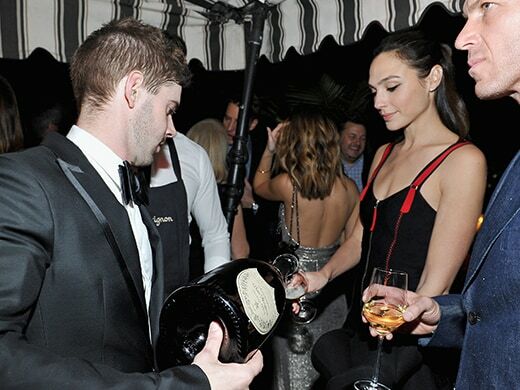 The “Wonder Woman” star had a dedicated security guard stationed in front of her patio table throughout the night. Salma Hayek, continuing her trend of pure candor, had no qualms about capturing the view herself. After Entertainment Tonight’s Carly Steel wrapped up casual on-camera arrival chats in one of the converted bedrooms, the one-time “Frida” had a friend shoot cellphone pictures of her on the balcony overlooking Sunset. The show beat “The X-Files” in ratings, won its timeslot and nearly doubled recent premiere numbers. I caught CBS chief Les Moonves near the elevators who accepted congratulations. “It’s back and the numbers were great,” Moonves told The Party Report. Other titans and cultural curiosities in the mix included New England Patriots owner Robert Kraft (whose team has the weekend off due to a playoff bye), Duran Duran bassist John Taylor, hat guy Nick Fouquet, and model Karrueche Tran. In a more somber and odd coincidence, Jim Belushi also made the scene. As part of well known Hollywood history, his older brother John died in this hotel back in 1982. His connection to the event and this year’s Globes is not clear. Those fully invested in this confluence of media and entertainment in the mix included Dawn Ostroff (President, Conde Nast Entertianment), CN Chief Business Officer Chris Mitchell, Pilar Guzman, and one of Hollywood’s skeleton keys, Ken Sunshine. Released earlier on Thursday, the party celebrated W’s 2018 “Best Performances” portfolio. This year’s honors featured six covers of duos: Jennifer Lawrence and Emma Stone; Mary J. Blige and Tom Hanks, Gadot and Franco; Daniela Vega and Robert Pattinson; Margot Robbie and Nicole Kidman; and Saoirse Ronan and Andrew Garfield. They are the leads among 29 awards-favored artists along with Hayek, Jessica Chastain, Daniel Kaluuya, Diane Kruger, Hong Chau, Timothee Chalamet, Allison Janney, Gary Oldman, Michelle Williams, Jake Gyllenhaal, and more. The Best Performances portfolio was co-produced with British Vogue, photographed by Juergen Teller, styled by Edward Enninful. Audi, who started their partnership with Amazon (which includes Sunday night’s post-show bash and Amazon music streaming in their chauffeured Q7’s) shuttled the talent. 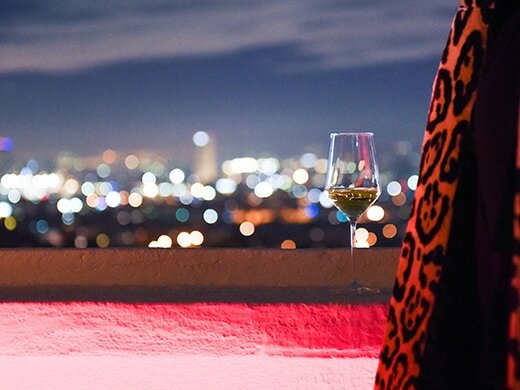 Dom Pérignon provided an endless pour of top shelf bubbles and Dior also partnered on the event. The Golden Globes air live coast to coast on NBC this Sunday, Jan. 7, at 8 p.m. ET/ 5 p.m. PT. Prediction: "The Shape of Water"
“Lady Bird” could win if voters want to send a message in a year where women are claiming their spot in Hollywood. “Get Out” could win if voters aren’t gun-shy after all the criticism the HFPA received for accepting it as a comedy. “The Disaster Artist” could even win if they just want to have fun. I give a narrow edge to “Get Out,” only because the film with the most critics’ awards tends to get a Globe, too. Ridley Scott’s movie isn’t even nominated for best picture, so it’s hard to imagine him winning here. Spielberg might do it, but the race is probably between the guys responsible for the boldest, biggest movies, Christopher Nolan for “Dunkirk” and Guillermo del Toro for “The Shape of Water.” “Dunkirk” feels a bit like old news by now, so look for the Hollywood Foreign Press Association to give this to the director for whom English is a second language. Gary Oldman is revered, under-recognized and overdue, and “Darkest Hour” gives him the kind of showcase that voters should celebrate. But his first Globe nomination is hardly a sure win, because he’s been an outspoken critic of the HFPA in the past, even calling for a boycott at one point. He changed his tune this year and said he was “very proud” of the nomination. If voters forgive and forget, he wins; if not, Timothée Chalamet could easily score an upset. Here’s betting the HFPA takes the high road. Prediction: Gary Oldman, "Darkest Hour"
Prediction: Frances McDormand, "Three Billboards Outside Ebbing, Missouri"
While Hugh Jackman could help the HFPA insist that the “musical” part of the category name actually means something, this is probably between Daniel Kaluuya and James Franco. And Franco has been omnipresent in the last month, charming everybody who gets near his movie – and while “Disaster Artist” might not be as important as “Get Out,” it’s pretty irresistible. Prediction: James Franco, "The Disaster Artist"
If the Globes didn’t have separate drama and musical/comedy acting categories, Saoirse Ronan and Margot Robbie are probably the only nominees who’d be contending for a spot in a single category. And Ronan is the only one who’d be contending to win. 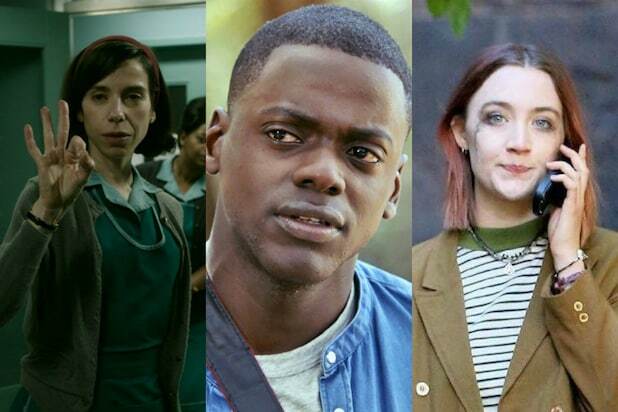 Prediction: Saoirse Ronan, "Lady Bird"
Prediction: Willem Dafoe, "The Florida Project"
Prediction: Laurie Metcalf, "Lady Bird"
A tight race between Greta Gerwig and Martin McDonagh might just be tipped in Gerwig’s direction by the fact that her screenplay, based on her own teenage years, is more heartfelt – and also by the fact that the HFPA might owe her one, since she wasn’t nominated for Best Director. Jonny Greenwood’s demented piano music would be the adventurous choice, John Williams’ the safest possible one. But this should go to Hans Zimmer for the bold “Dunkirk” or Alexandre Desplat for the evocative “The Shape of Water.” Look for emotion to take the day. Prediction: "This is Me," "The Greatest Showman"